Planetary seismology is not only the best tool to determine the internal structure of planets, but it also enables us to monitor the tectonic activity of planets, to determine the impact cratering rates of planets, and to quantify acoustic sources of planetary atmospheres. 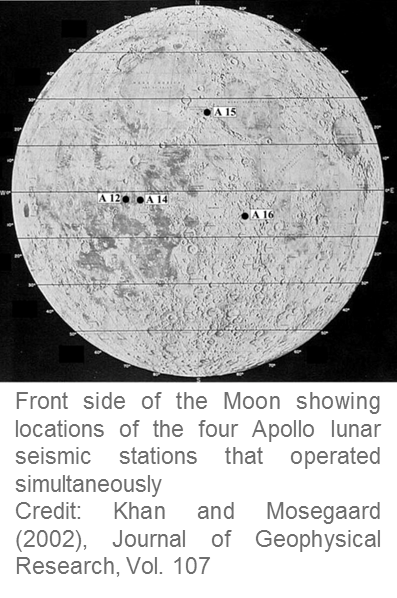 The Apollo Passive Seismic Experiment (PSE), conducted as a component of the Apollo Lunar Surface Experiment Package (ALSEP), was not only the unique example of a successful seismic experiment on a terrestrial body other than Earth, but also one of the few examples of seismic data used by the science community more than forty years after their acquisition. The experiment successfully led to the discovery of the crust and core of the Moon, quake mechanisms never observed on Earth, and provided the impact rate of meteoroids on the Earth-Moon system . The first goal of the Forum will be to review the achievements of the Apollo seismic experiment, almost forty years after the termination of ALSEP, with a special focus on the analyses made in the last fifteen years, and to identify the science goals of a new post-Apollo seismic return on the Moon. The Forum will not only focus on the lunar interior, but will also address science goals associated with the use of the Moon as a platform enabling the detection of gravitational waves, which is made possible by its very low background seismic noise. The second goal of the Forum will be to review the perspective of planetary seismology on other bodies of the solar system, such as Mars, Venus, Mercury and small bodies. This assessment will be made not only for the ongoing missions in development, but also in terms of seismic waves and source modeling, with specific focus on differences between Earth and planets (such as impact processes, scattering of waves in a high-Q crust, and interior/atmosphere coupling). This FORUM intends to bring together multidisciplinary key scientists from different countries with the objective of to not only review the unique heritage of the lunar seismology experiment and data sets, but also to contribute to the achievement of a deeper scientific understanding of future planetary seismology where international coordination and collaboration is needed. The output of the FORUM organized at ISSI-BJ will lead also to the publication of a report in the TAIKONG magazine, which will be understandable to the non-expert.